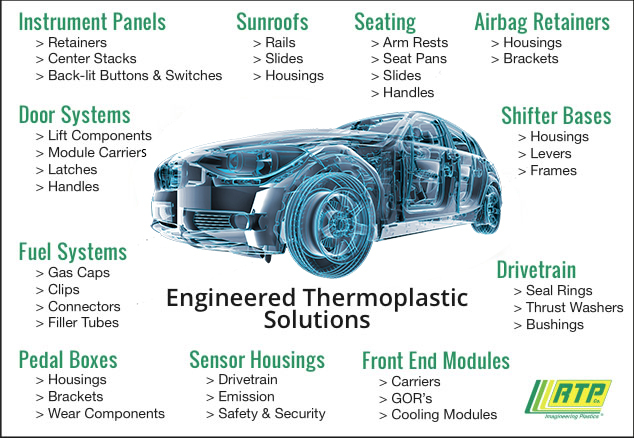 RTP Company offers a complete portfolio of thermoplastic materials for the automotive industry. We’ve successfully helped automotive manufactures reduce vehicle weight, lower vehicle emissions, and increase safety. RTP Company has successfully helped manufacturers reduce weight in automotive applications, including shifter bases, arm rests, sunroofs, pedal housings, front end modules, door modules, and more! To learn more, see our Enlightened Solutions page. To meet the growing demand for low emission requirements, RTP Company has developed a line of low emission products including a VLF PP product for use in automotive interior applications. These PP VLF products satisfy Original Equipment Manufacturer (OEM) mandates to reduce the Volatile Organic Compound (VOC) levels found in thermoplastic materials specified for use in automotive interior applications. International legislation and automotive OEMs have identified the need to reduce odor, fogging, and total VOCs to improve air quality and the safety of vehicle interiors. Low emission PP VLF compounds from RTP Company are designed for structural use and provide exceptional strength, stiffness, and dimensional accuracy, with reinforcement levels of 20 – 50 wt%. They have been tested and authenticated by approved outside laboratories according to German Automotive Industry (VDA) test methods for odor, fogging, and total VOC emissions. Results from VDA test methods show that PP VLF products from RTP Company meet or exceed the OEM requirements in all three categories (see Figure 1). These environmentally-friendly VLF compounds can be used in automotive interior applications such as instrument panels, door module carriers, overhead and center consoles, seating, load floors, pedal boxes, spare tire covers and storage bins. In addition to our low emission offering we are capable of making appearance friendly VLF PP materials to meet automotive interior and exterior requirements… UV stability, scratch and mar performance, low gloss, uniform surface appearance combined with the outstanding strength and impact of VLF. RTP Company provides ready-to-mold plastic compounds with EMI Shielding properties that are ideal for the housings of automotive sensing systems. In addition to protecting sensing systems from the damaging effects of EMI, housings made from these compounds are significantly lighter than their metal counterparts, thereby reducing overall vehicle weight. Learn more about EMI Shielding and Automotive EMI Sensing Systems by viewing our interactive page here. RTP also has a full line of specialty compounds to meet today’s demanding applications including Wear, Conductive, Color, Elastomer, Structural and Flame Retardant. Please see the Products section for a complete listing of our products. Receive additional information and contact us! From high-tech thermoplastic compounds to unfilled resins, our experts will find a material solution that fits your application’s unique requirements.